﻿ Industrial UPS KONIS-PI – KONČAR Elektronika i informatika d.d. System of uninterruptible AC power supply type KONIS-PI is designed for uninterruptible power supply in important industrial and similar facilities. The DC power supply system type KONIS-P is designed for uninterruptible power supply of specific DC loads whose reliable operation is of particular importance. Unlike standard UPSs, which are compact, integrated in design, industrial UPSs are designed based on standard independent rectifiers, inverters, static circuit breakers and batteries. Rectifiers and inverters are modular and operate in a redundant parallel configuration, which further increases the reliability of the system. The main parts of the system are: modular rectifiers, battery, modular inverters, static switch, service switch, control unit and distribution panel. In normal operation the loads are supplied by inverters, whose input voltage is provided by rectifiers. In case of failure of mains voltage, inverters are supplied by the battery. After mains voltage returns, rectifiers continue to supply inverters and simultaneous charge the battery. The battery is a key component of reliability and availability of power supply. The system KONIS-PI provides all the time battery charged and its recharging by precise DC voltage without ripple. The operation of the power supply system is controlled by a microprocessor control unit, type KONLOG. It manages the system in real time and enables parameter setting, local and remote insight into measurements and signaling. 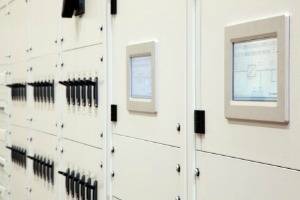 It is possible to communicate with the station computer, dispatch center and specialized service center, which greatly contributes to reducing maintenance costs and to additional increasing the reliability and availability of the entire power supply system.